5 Palestinian villages in the Jordan Valley were isolated and 51, 000 dunams (12,600 acres) of Palestinian land seized by Israeli occupation authorities Tuesday, Maan News reported. Palestinian Authority (PA) official Mutaz Bisharat, told the ‘Voice of Palestine’ radio show that Israeli occupation authorities seized control over water springs, farming equipment, and solar panels, all belonging to Palestinians. The Jordan Valley constitutes one third of the occupied West Bank, which is now 88% under Israeli military command. Bisharat stated that by isolating the villages in the Tubas district, and denying Palestinians access to their homes, Israeli authorities are exposing their intent to expel all Palestinians from the Jordan Valley. 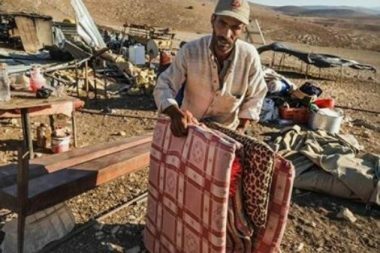 Human Rights organizations interpret Israel’s protracted attacks on Jordan Valley civilians as violating international humanitarian law, regardless of means of displacement, through confiscations, demolition of homes, and evictions. Article 8(2)(a)(vii) of the Rome Statute states; “Unlawful deportation or transfer or unlawful confinement” is a war crime. Article 7(1)(d) of the Rome Statute states; “Deportation or forcible transfer of population” is a crime against humanity.